Friendly Skies (could be friendlier) — There is no "Away"
On a recent United Airlines flight home to San Francisco from Salt Lake City, I asked the flight attendant if I could please use my own stainless steel cup for my beverage. "I'm sorry, we aren't allowed to do that" and after handing me my drink in a little plastic tumbler, she informed me that I could pour that into my own cup. Not exactly what I was after. Nevermind that the flight attendant on the outbound flight accommodated my request without batting an eye - I guess she had special clearance to "do that". I reached out to United Airlines via Facebook, and they politely thanked me for my suggestions that flight attendants be allowed to fill passenger's cups (like Virgin Airlines does), and also that they consider switching from plastic cups to paper cups. Paper cups are compostable - they could be crumpled up (thus greatly reducing the volume), and could be taken away to a commercial compost facility along with the napkins - For a ballpark idea on how much plastic waste could be averted by switching to paper cups, consider the work of Chris Jordan, whose digital artwork depicts consumerism's staggering numbers as a visual kick in the gut. Here is his piece "Plastic Cups" showing one million plastic airline cups - The number used on U.S. airlines every six hours (data from 2008). It's incomprehensible. What makes it truly unbearable is that it's entirely unnecessary. 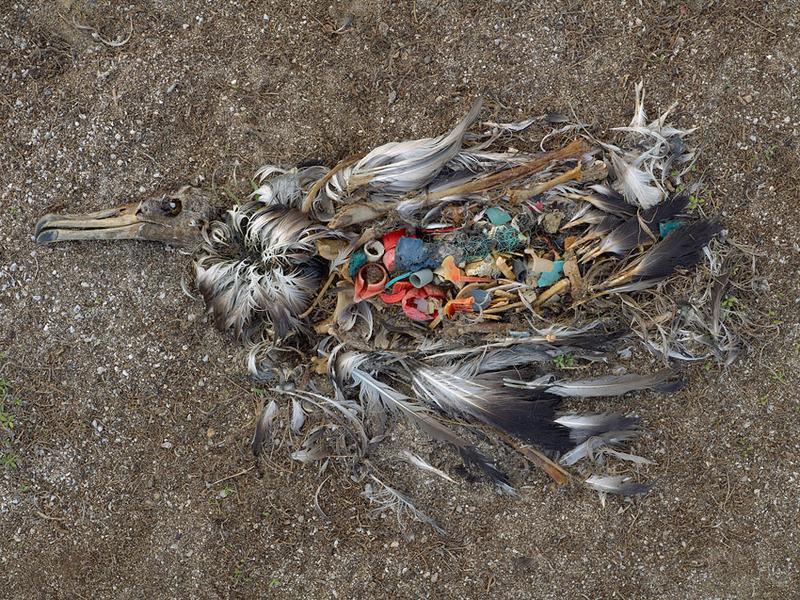 *Chris Jordan is also the artist responsible for the arresting "Midway" photographs of the plastic filled bodies of albatross on Midway Island.